Floor Staff games are a great way to teach your students the numbers of the lines and spaces, and the pitch names of notes on the staff. This is music theory without the worksheets! 1. Staff Jump An elimination game to learn the numbers of the lines and spaces. Have half of your students stand on line one. Call out a line for them to jump to – line three! line four! The last student to get to the correct line is eliminated. Have the other half of your students jump to the spaces. When you introduce the letter names of the lines and spaces, repeat the game using letter names. 2. Letter Names Jump Group one will jump the lines on the music staff. The teacher calls out a line note – E, G, B, D, F – and the students jump to the line that she calls. To play this as an elimination game (optional), the last child to land on the line that is called is out. The last child left after the eliminations is the winner. Group two will jump the spaces on the music staff. 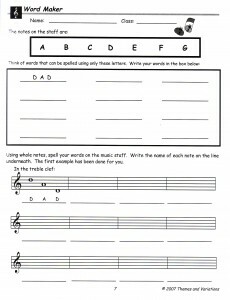 The teacher will call out a space note name – F, A, C, E. If groups are small, repeat the note names and jump as needed until all the children have had a turn. When the students are very confident jumping lines or spaces, have each group jump to the note name that is called using both notes that are on lines and in spaces. 3. Staff Relay Divide the class into two-four teams. On small paper plates write a letter name of a note – A B C D E F G. Each team is given a pile of notes. Teams race to place their notes on the correct line or space of the floor staff. The first team finished with ALL notes correctly placed wins. 4. Staff Beanbag Toss Divide the class into two-four teams. Each team has a pile of bean bags. A team member tosses a bean bag onto the staff. They must correctly name the line or space it lands on. If they are correct, the bean bag stays. If not, the bean bag is removed by the teacher. The team with the most bean bags on the staff wins. 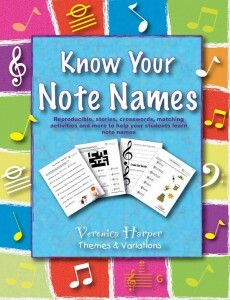 If you want to reinforce note names with worksheets, Themes & Variations publishes a great collection called, “Know Your Note Names” which has 56 reproducible pages with fun activities for teaching, practicing and assessing note names. Visit www.musicplay.ca for info. 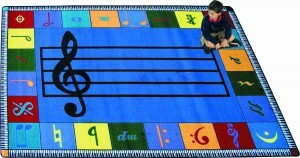 This entry was posted in Music Theory and tagged Denise Gagne, floor staff games, learn note notes, music rug on January 1, 2013 by Denise Gagne.